Last weekend we hosted a group press trip to Northcote to take part in the cookery school. Six journalists from a host of exciting titles including The Week Online, House and Garden, The Metro and The Spectator spent a day developing their culinary skills in Northcote’s Michelin Star kitchen. Northcote is our luxury country house hotel client, located in the Ribble Valley, Lancashire with an award-winning restaurant that has held a Michelin Star for over 20 years. 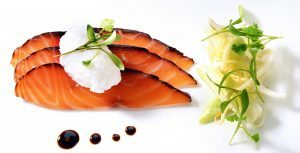 Northcote was founded by Chef Patron Nigel Haworth and Managing Director Craig Bancroft in 1983 and prides itself on being a place of true gastronomic excellence. Adding to this culinary oasis, is the cookery school, introduced by Nigel Haworth and renowned as one of the best in the UK. The cookery school is located right in the heart of Northcote’s Michelin Star kitchen and offers both half and full days’ cookery courses teaching participants everything from skills & techniques, to entertaining and themed classes. 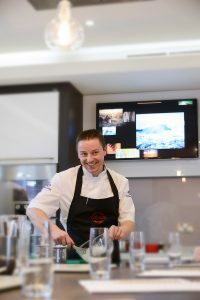 The courses are delivered by Head Tutor – Michael Vanheste, however, Executive Head Chef Lisa Goodwin-Allen and Nigel Haworth himself also offer their own exclusive masterclasses. Northcote also welcomes a number of exciting guest chefs to teach at the cookery school. Over the coming months, chefs such as Mark Hix, (27th and 28th April), Chinese chef Victor Yu (4th and 6th July) and renowned Indian chef Aktar Islam (14th and 15th July) will be coming coming to Northcote to take over the cookery school for a few days to teach guests how to make their own unique menus. The cookery school puts you right at the heart of the action and with a maximum of eight students taking part in each class, guests are treated to a truly intimate culinary experience. During their stay, the journalists took part in the “Northcote at Home’ course. 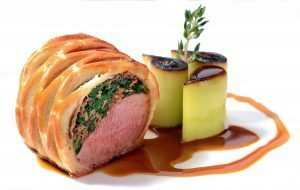 This course was originally created by Nigel Haworth and has quickly become one of the hotel’s most popular classes, giving participants the chance to recreate a Michelin Star menu at home. The journalists made a delicious meal consisting of Home Cured Treacle Salmon with a lime and ginger marshmallow, followed by a lamb wellington and an apple crumble soufflé for dessert. The course taught them everything they would need to know including baking, basic knife skills, frying and grilling and with the help of Michael Vanheste and the Northcote team, the journalists left Northcote, ready to use their new Michelin Star level culinary skills at home. Get social with us! We're on Twitter, Instagram and Linkedin.